The Dow Future has advanced 75 points to 19896. 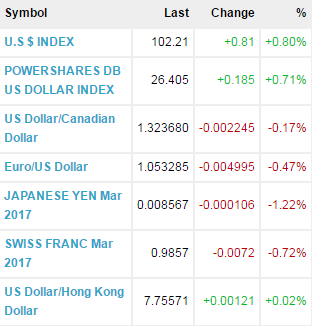 The US Dollar Index rose 0.81 points to 102.21. Gold is falling 5.245 dollars to 1172.700. 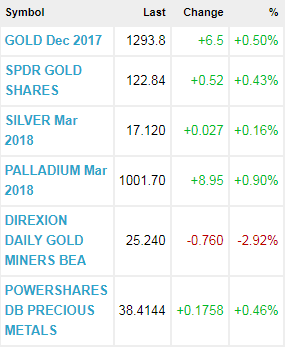 Silver is falling 0.0880 dollars to 16.4735. The Dow Industrials moved up 64.51 points, at 19963.80, while the S&P 500 advanced 7.98 points, last seen at 2276.98. The Nasdaq Composite moved higher by 33.02 points to 5520.96. The March Dollar posted an inside day with a higher close on Friday as it consolidates some of this week's decline but remains below the 20-day moving average crossing at 102.43. The high-range close sets the stage for a steady to higher opening when Monday's night session begins trading. Stochastics and the RSI are neutral to bearish signaling that sideways to lower prices are possible near-term. If March extends this week's decline, the 50-day moving average crossing at 100.79 is the next downside target. Closes above the 10-day moving average crossing at 102.69 would temper the near-term bearish outlook. First resistance is weekly resistance crossing at 103.67. Second resistance is weekly resistance crossing at 107.38. First support is the 50-day moving average crossing at 100.79. Second support is December's low crossing at 99.25. The March Euro closed lower on Friday as it consolidated some of this week's rally but remains above the 20-day moving average crossing at 105.34. The low-range close sets the stage for a steady to lower opening when Monday's night session begins trading. Stochastics and the RSI are neutral to higher signaling that sideways to higher prices are possible near-term. If March extends this week's rally, the 50-day moving average crossing at 107.29 is the next upside target. If March renews the decline off November's high, weekly support crossing at 102.59 is the next downside target. First resistance is the 50-day moving average crossing at 107.29. Second resistance is December's high crossing at 109.23. First support is Tuesday's low crossing at 103.73. Second support is weekly support crossing at 102.59. The March British Pound closed lower on Friday. The low-range close sets the stage for a steady to lower opening when Monday's night session begins trading. Stochastics and the RSI are turning neutral to bullish signaling that sideways to higher prices are possible near-term. Closes above the 50-day moving average crossing at 1.2459 are needed to confirm that a low has been posted. If March renews the decline off December's high, October's low crossing at 1.2119 is the next downside target. First resistance is the 50-day moving average crossing at 1.2459. Second resistance is the 25% retracement level of the June-August-decline crossing at 1.2777. First support is Tuesday's low crossing at 1.2217. Second support is October's low crossing at 1.2119. The March Swiss Franc posted an inside day with a lower close on Friday as it consolidates some of Thursday's rally. The low-range close sets the stage for a steady to lower opening when Monday's night session begins trading. Stochastics and the RSI are neutral to bullish signaling that sideways to higher prices are possible near-term. Closes above the 50-day moving average crossing at 0.9990 would open the door for a larger-degree rally during the first half of January. If March renews the decline off November's high, weekly support crossing at 0.9686 is the next downside target. First resistance is the 50-day moving average crossing at 0.9990. Second resistance is the reaction high crossing at 1.0214. First support is Tuesday's low crossing at 0.9713. Second support is weekly support crossing at 0.9686. The March Canadian Dollar closed slightly higher on Friday as it extends the rally off December's low. Stochastics and the RSI are neutral to bullish signaling that sideways to higher prices are possible near-term. The mid-range close sets the stage for a steady to higher opening when Monday's night session begins trading. If March extends the rally off December's low, December's high crossing at 76.55 is the next upside target. Closes below the 10-day moving average crossing at 74.52 would confirm that a short-term top has been posted. First resistance is today's high crossing at 75.94. Second resistance is December's high crossing at 76.55. First support is the 10-day moving average crossing at 74.52. Second support is December's low crossing at 0.7360. The March Japanese Yen closed lower on Friday and the low-range close sets the stage for a steady to lower opening when the Monday's night session begins trading. Stochastics and the RSI are neutral to bullish signaling that sideways to higher prices are possible near-term. If March extends Thursday's rally, the reaction high crossing at 0.8891 is the next upside target. If March renews the decline off August's high, the 87% retracement level of the 2015-2016-rally crossing at 0.8404 is the next downside target. First resistance is today's high crossing at 0.8712. Second resistance is the reaction high crossing at 0.8891. First support is Tuesday's low crossing at 0.8454. Second support is the 87% retracement level of the 2015-2016-rally crossing at 0.8404. 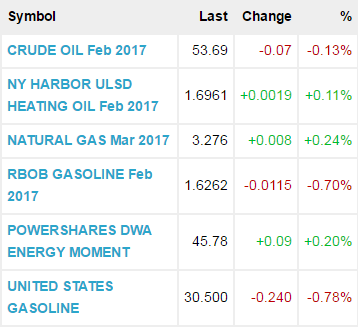 February crude oil closed slightly lower on Friday. The mid-range close sets the stage for a steady opening when Monday's night session begins. Stochastics and the RSI are turning neutral to bullish signaling that sideways to higher prices are possible near-term. If February renews the rally off November's low, the 38% retracement level of the 2012-2016-decline crossing at 57.93 is the next upside target. Closes below Tuesday's low crossing at 52.11 would open the door for a possible test of the 50-day moving average crossing at 50.17. First resistance is December's high crossing at 55.44. Second resistance is the 38% retracement level of the 2012-2016-decline crossing at 57.93. First support is the reaction low crossing at 50.76. Second support is the 50-day moving average crossing at 50.17. February heating oil closed higher on Friday as it consolidated some of Tuesday's decline. The mid-range close sets the stage for a steady to higher opening when Monday's night trading session begins. Stochastics and the RSI are neutral signaling that sideways trading is possible near-term. If December renews the decline off Tuesday's high, the reaction low crossing at 162.33 is the next downside target. If February resumes the rally off November's low, the 50% retracement level of the 2015-2016-decline crossing at 195.69 is the next upside target. First resistance is Tuesday's high crossing at 176.47. Second resistance is the 50% retracement level of the 2015-2016-decline crossing at 195.69. First support is the reaction low crossing at 162.33. Second support is the 50-day moving average crossing at 159.56. February unleaded gas closed lower on Friday. The low-range close sets the stage for a steady to lower opening when Monday's night session begins trading. Stochastics and the RSI are neutral to bearish signaling that a short-term top might be in or is near. Closes below the 20-day moving average crossing at 160.76 are needed to confirm that a short-term top has been posted. If February resumes the rally off November's low, the 50% retracement level of the 2015-2016-decline crossing at 176.71 is the next upside target. First resistance is Tuesday's high crossing at 170.95. Second resistance is the 50% retracement level of the 2015-2016-decline crossing at 176.71. First support is the 20-day moving average crossing at 160.76. Second support is the 50-day moving average crossing at 149.75. February Henry natural gas closed higher due to short covering on Friday as it consolidates some of this week's decline. The mid-range close sets the stage for a steady to higher opening when Monday's night session begins trading. Stochastics and the RSI are oversold but remain neutral to bearish signaling that sideways to lower prices are possible near-term. If February extends this week's decline, the reaction low crossing at 3.067 is the next downside target. Closes above Tuesday's gap crossing at 3.690 would confirm that a short-term low has been posted. First resistance is December's high crossing at 3.902. Second resistance is the 62% retracement level of the 2012-2016-decline crossing at 4.052. First support is Thursday's low crossing at 3.172. Second support is the reaction low crossing at 3.067. March coffee closed lower on Friday as it consolidates some of this week's rally. The low-range close sets the stage for a steady to lower opening on Monday. Stochastics and the RSI are neutral to bullish signaling that sideways to higher prices are possible near-term. If March extends this week's rally, the 50-day moving average crossing at 15.29 is the next upside target. Closes below the 10-day moving average crossing at 13.81 would confirm that a short-term top has been posted. March cocoa closed lower on Friday but remains above the 20-day moving average crossing at 22.35. The low-range close sets the stage for a steady to lower opening on Monday. Stochastics and the RSI are neutral to bullish signaling that sideways to higher prices are possible near-term. If March extends this week's rally, the 50-day moving average crossing at 23.76 is the next upside target. If March renews the decline off August's high, weekly support crossing at 20.34 is the next downside target. March sugar closed lower on Friday as it consolidates some of the rally off December's low. The high-range close set the stage for a steady to higher opening on Monday. Stochastics and the RSI are overbought but remain neutral to bullish signaling that sideways to higher prices are possible near-term. If March extends the aforementioned rally, November's high crossing at 22.59 is the next upside target. Closes below the 20-day moving average crossing at 19.09 would confirm that a short-term top has been posted. March cotton closed higher on Friday and the high-range close sets the stage for a steady to higher opening on Monday. Stochastics and the RSI are neutral to bullish signaling that sideways to higher prices are possible near-term. If March extends the rally off December's low, August's high crossing at 78.00 is the next upside target. Closes below the 50-day moving average crossing at 70.80 would confirm that a short-term top has been posted. March Corn closed down 2 1/2-cents at 3.58 3/4. March corn closed lower on Friday as it consolidates some of this week's rally. The mid-range close sets the stage for a steady to lower opening when Monday's night session begins trading. Stochastics and the RSI are neutral to bullish signaling that sideways to higher prices are possible near-term. If March extends this week's rally, December's high crossing at 3.64 3/4 is the next upside target. Closes below the 10-day moving average crossing at 3.53 1/4 would temper the near-term friendly outlook. First resistance is December's high crossing at 3.64 3/4. Second resistance is October's high crossing at 3.69. First support is December's low crossing at 3.41 3/4. Second support is the reaction low crossing at 3.35. March wheat closed down 2 1/2-cents at 4.23 3/4. March wheat closed lower on Friday as it consolidates some of this week's rally. The low-range close sets the stage for a steady to lower opening when Monday's night session begins trading. Stochastics and the RSI are overbought but remain neutral to bullish signaling that sideways to higher prices are possible near-term. If March extends this week's rally, the reaction high crossing at 4.29 3/4 is the next upside target. Closes below the 10-day moving average crossing at 4.08 3/4 would confirm that a short-term top has been posted. First resistance is the reaction high crossing at 4.29 3/4. Second resistance is October's high crossing at 4.45 3/4. First support is December's low crossing at 3.92 3/4. Second support is the 87% retracement level of the 1999-2008-rally on the weekly continuation chart crossing at 3.67 1/4. March Kansas City Wheat closed down 1-cent at 4.33 1/2. March Kansas City wheat closed lower on Friday as it consolidated some of the rally off December's low. The low-range close sets the stage for a steady to lower opening on Monday. Stochastics and the RSI are overbought but remain neutral to bullish signaling that sideways to higher prices are possible near-term. If March extends the aforementioned rally, October's high crossing at 4.45 1/4 is the next upside target. Closes below the 20-day moving average crossing at 4.15 3/4 would confirm that a short-term top has been posted. First resistance is the 25% retracement level of the April-December decline crossing at 4.39. Second resistance is October's high crossing at 4.45 1/4. First support is the 20-day moving average crossing at 4.15 3/4. Second support is December's low crossing at 3.99 3/4. March Minneapolis wheat closed up 2 1/2-cents at 5.52 3/4. March Minneapolis wheat closed higher on Friday and tested the 62% retracement level of the June-August-decline crossing at 5.54 3/4 as it extends the rally off August's low. The high-range close sets the stage for a steady to higher opening when Monday's night session begins trading. Stochastics and the RSI are overbought but remain neutral to bullish signaling that sideways to higher prices are is possible near-term. If March extends the rally off August's low, the 75% retracement level of the June-August-decline crossing at 5.68 1/2 is the next upside target. Closes below the 50-day moving average crossing at 5.31 1/2 would confirm that a short-term top has been posted. First resistance is the 62% retracement level of the June-August-decline crossing at 5.54 3/4. Second resistance is the 75% retracement level of the June-August-decline crossing at 5.68 1/2. First support is the 50-day moving average crossing at 5.31 1/2. Second support is the reaction low crossing at 5.28. March soybeans closed down 17 1/4-cents at 9.95 1/4. March soybeans closed lower on Friday. The low-range close sets the stage for a steady to lower opening when Monday's night session begins trading. Stochastics and the RSI are neutral signaling that sideways to lower prices are possible near-term. If March extends the decline off November's high, November's low crossing at 9.83 3/4 is the next downside target. Closes above the 50-day moving average crossing at 10.21 3/4 are needed to confirm that a short-term low has been posted. First resistance is the 50-day moving average crossing at 10.21 3/4. Second resistance is November's high crossing at 10.74. First support is Wednesday's low crossing at 9.92 3/4. Second support is November's low crossing at 9.83 3/4. March soybean meal closed down $6.70 at 311.50. March soybean meal closed lower on Friday. The low-range close sets the stage for a steady to lower opening when Monday's night session begins trading. Stochastics and the RSI are neutral signaling that sideways trading is possible near-term. If March resumes the decline off November's high, November's low crossing at 308.40 is the next downside target. If March renews the rally off December's low, November's high crossing at 331.70 is the next upside target. First resistance is last Wednesday's high crossing at 324.20. Second resistance is November's high crossing at 331.70. First support is November's low crossing at 308.40. Second support is October's low crossing at 298.60. March soybean oil closed down 22-pts. at 35.00. March soybean oil closed lower on Friday. The low-range close sets the stage for a steady to lower opening when Monday's night session begins trading. Stochastics and the RSI are oversold but are turning neutral to bullish signaling that a low might be in or is near. Closes above the 20-day moving average crossing at 36.00 would confirm that a short-term low has been posted. If March resumes the decline off December's high, November's low crossing at 33.99 is the next downside target. First resistance is the 20-day moving average crossing at 36.00. Second resistance is December's high crossing at 38.62. First support is December's low crossing at 34.57. Second support is November's low crossing at 33.99. The March NASDAQ 100 posted a new all-time high as it closed higher on Friday following December's U.S. jobs report that was termed generally positive by investors. 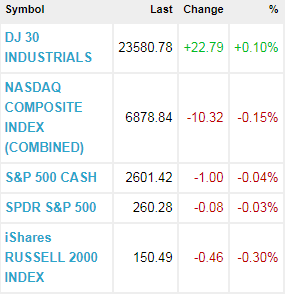 Today's high-range close sets the stage for a steady to higher opening when Tuesday's night session begins trading. If March extends today's rally into uncharted territory, upside targets will be hard to project. Closes below the 50-day moving average crossing at 4844.69 would confirm that a short-term top has been posted. First resistance is today's high crossing at 5017.50. Second resistance is unknown. First support is the 50-day moving average crossing at 4844.69. Second support is December's low crossing at 4700.50. The March S&P 500 closed higher on Friday and posted a new all-time high. The high-range close sets the stage for a steady to higher opening when Monday's night session begins trading. Stochastics and the RSI are neutral to bullish signaling that sideways to higher prices are possible near-term. If March extends today's rally into uncharted territory, upside targets will be hard to project. Closes below last Friday's low crossing at 2229.00 would confirm that a short-term top has been posted. First resistance is today's high crossing at 2276.50. Second resistance is unknown. First support is last Friday's low crossing at 2229.00. Second support is the 50-day moving average crossing at 2198.16. 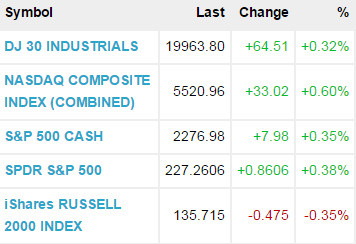 The Dow closed higher on Friday following the December U.S. jobs report which investors viewed as generally positive. The Jobs report showed that the U.S. Economy created 156,000 jobs last month, which was below pre-report estimates of 180,000 jobs forecasted. However, sharp upward revisions for November jobs number and a slight trimming of October number means the latest payrolls were more or less in line, according to analysts. The high-range close sets the stage for a steady to higher opening when Monday's night session begins trading. Stochastics and the RSI are neutral to bullish signaling that sideways to higher prices are possible near-term. If the Dow extends this year's rally into uncharted territory, upside targets will be hard to project. Closes below last Friday's low crossing at 19,718.67 are needed to confirm that a short-term top has been posted. First resistance is 20,000. Second resistance is unknown. First support is last Friday's low crossing at 19,718.67. Second support is the 25% retracement level of the November-January-rally crossing at 19,470.06. March T-bonds closed down 24/32's at 151-24. 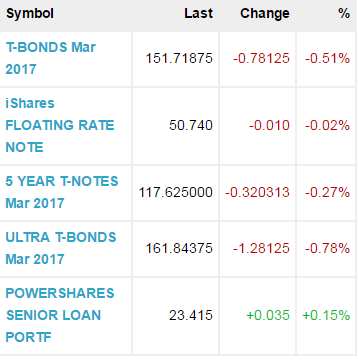 March T-bonds closed lower on Friday as it consolidates some of this week's rally. The low-range close sets the stage for a steady to lower opening when Monday's night session begins trading. Stochastics and the RSI are overbought but remain neutral to bullish signaling that sideways to higher prices are possible near-term. Closes above the 50-day moving average crossing at 152-30 would open the door for additional gains during the first half of January. Closes below the 20-day moving average crossing at 149-14 would confirm that a short-term top has been posted. First resistance is the 50-day moving average crossing at 152-30. Second resistance is today's high crossing at 153-09. First support is the 20-day moving average crossing at 149-14. Second support is December's low crossing at 147-04. March T-notes closed down 140/32's at 124-125. March T-notes closed lower due to profit taking on Friday as it consolidates some of the rally off December's low. The low-range close sets the stage for a steady to lower opening when Monday's night session begins trading. Stochastics and the RSI are overbought and are turning neutral to bearish signaling that a short-term top might be in or is near. Closes above the 50-day moving average crossing at 125.138 would open the door for additional gains near-term. Closes below the 20-day moving average crossing at 123.231 would temper the near-term bullish outlook. First resistance is today's high crossing at 125.105. Second resistance is the 50-day moving average crossing at 125.138. First support is the 20-day moving average crossing at 123.231. Second support is December's low crossing at 122.145. February hogs closed lower on Friday. The low-range close sets the stage for a steady to lower opening when Monday's session begins trading. Stochastics and the RSI are neutral to bearish signaling that a short-term top might be in or is near. Closes below the 20-day moving average crossing at 63.79 are needed to confirm that a short-term top has been posted. If February resumes the rally off October's low, the 87% retracement of the June-October-decline crossing at 67.18 is the next upside target. First resistance is Tuesday's high crossing at 66.90. Second resistance is the 87% retracement of the June-October-decline crossing at 67.18. First support is the 20-day moving average crossing at 63.79. Second support is last Tuesday's low crossing at 62.15. February cattle closed down $0.25 at 114.83. February cattle closed lower on Friday and below the 20-day moving average crossing at 114.95 confirming that a short-term top has been posted. The high-range close sets the stage for a steady to higher opening when Monday's session begins trading. Stochastics and the RSI are neutral to bearish signaling that sideways to lower prices are possible near-term. If February renews the rally off October's low, March's high crossing at 122.75 is the next upside target. First resistance is last Friday's high crossing at 118.50. Second resistance is March's high crossing at 122.75. First support is the reaction low crossing at 112.65. Second support is December's low crossing at 108.17. March Feeder cattle closed up $0.05 at $123.80. March Feeder cattle closed higher on Friday as it consolidates some of this week's decline. The high-range close sets the stage for a steady to higher opening when Monday's session begins trading. Stochastics and the RSI are oversold but remain neutral to bearish signaling that sideways to lower prices are possible near-term. If March extends this week's decline, the 50-day moving average crossing at 121.58 is the next downside target. If March renews the rally off October's low, the reaction high crossing at 130.85 is the next upside target. First resistance is last Friday's high crossing at 127.90. Second resistance is the reaction high crossing at 130.85. First support is the 50-day moving average crossing at 121.58. Second support is the reaction low crossing at 120.00. February gold posted an inside day with a lower close on Friday as it consolidates some of the rally off December's low. The low-range close sets the stage for a steady to lower opening when Monday's night session begins trading. Stochastics and the RSI are overbought but remain neutral to bullish signaling that sideways to higher prices are possible near-term. If February extends the aforementioned rally, the 50-day moving average crossing at 1200.60 is the next upside target. Closes below the 20-day moving average crossing at 1151.70 would confirm that a short-term top has been posted. First resistance is Thursday's high crossing at 1183.80. Second resistance is the 50-day moving average crossing at 1200.60. First support is December's low crossing at 1124.30. Second support is the 87% retracement level of the 2015-2016-rally crossing at 1097.80. March silver closed lower on Friday as it consolidates some of the rally off December's low. The mid-range close set the stage for a steady to higher opening when Monday's night session begins trading. Stochastics and the RSI are neutral to bullish signaling that sideways to higher prices are possible near-term. If March extends the aforementioned rally, the 50-day moving average crossing at 17.009 is the next upside target. Closes below last Friday's low crossing at 15.880 would temper the near-term friendly outlook. First resistance is the 50-day moving average crossing at 17.009. Second resistance is December's high crossing at 17.300. First support is the 75% retracement level of the 2015-2016-rally crossing at 15.678. Second support is the 87% retracement level of the 2015-2016-rally crossing at 14.812. 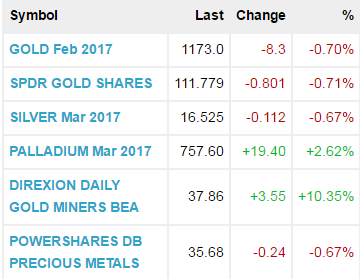 March copper closed slightly higher on Friday. The high-range close sets the stage for a steady to higher opening when Monday's night session begins trading. Stochastics and the RSI are neutral to bullish signaling that sideways to higher prices are possible near-term. Multiple closes above the 20-day moving average crossing at 254.35 are needed to confirm that a low has been posted. Closes below the 50-day moving average crossing at 249.98 would open the door for a larger-degree decline into early-January. First resistance is the 20-day moving average crossing at 254.35. Second resistance is November's high crossing at 275.30. First support is the 50-day moving average crossing at 249.98. Second support is the reaction low crossing at 243.50. January crude oil closed lower due to profit taking on Monday. The mid-range close sets the stage for a steady to lower opening when Tuesday's night session begins. Stochastics and the RSI are overbought but remain neutral to bullish signaling that sideways to higher prices are possible near-term. If January extends the rally off June's low, weekly resistance crossing at 60.00 is the next upside target. Closes below the 20-day moving average crossing at 56.46 would confirm that a short-term top has been posted. First resistance is last Friday's high crossing at 59.05. Second resistance is weekly resistance crossing at 60.00. First support is the 20-day moving average crossing at 56.46. Second support is the reaction low crossing at 55.00. 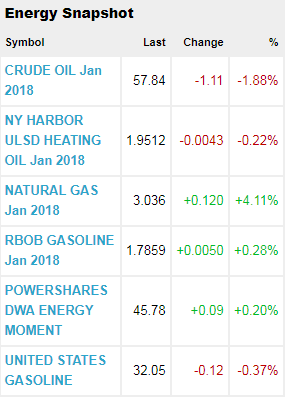 January heating oil closed slightly lower on Monday. The mid-range close sets the stage for a steady to lower opening when Tuesday's night trading session begins. Stochastics and the RSI are overbought but remain neutral to bullish signaling that sideways to higher prices are possible near-term. If January extends the rally off October's low, the 50% retracement level of the 2014-2016-decline crossing at 198.69 is the next upside target. Closes below the 20-day moving average crossing at 191.89 would confirm that a short-term top has been posted. First resistance is today's high crossing at 196.52. Second resistance is the 50% retracement level of the 2014-2016-decline crossing at 198.69. First support is the 20-day moving average crossing at 191.89. Second support is the reaction low crossing at 188.70. January unleaded gas closed slightly higher on Monday. The high-range close sets the stage for a steady to higher opening when Tuesday's night session begins trading. Stochastics and the RSI are neutral to bullish signaling that sideways to higher prices are possible near-term. If January extends last week's rally, November's high crossing at 181.51 is the next upside target. If January renews the decline off November's high, the 50-day moving average crossing at 165.99 is the next downside target. First resistance is November's high crossing at 181.51. Second resistance is the May-2015 high crossing at 185.71. First support is the reaction low crossing at 171.20. Second support is the 50-day moving average crossing at 165.99. January Henry natural gas closed higher due to short covering on Monday. The high-range close sets the stage for a steady to higher opening when Tuesday's night session begins trading. Stochastics and the RSI are oversold but remain neutral to bearish signaling that sideways to lower prices are possible near-term. If January extends this month's decline, the January-2016-low crossing at 2.720 is the next downside target. Closes above the 20-day moving average crossing at 3.145 would confirm that a short-term low has been posted. First resistance is the 20-day moving average crossing at 3.145. Second resistance is the 50-day moving average crossing at 3.208. First support is last Friday's low crossing at 2.903. Second support is the January-2016-low crossing at 2.720. 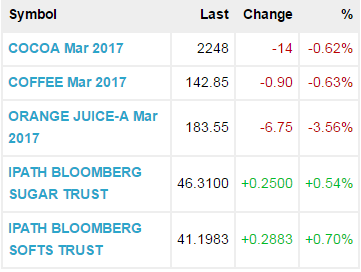 March coffee closed higher on Monday. The low-range close sets the stage for a steady to lower opening on Tuesday. Stochastics and the RSI are neutral to bullish signaling that sideways to higher prices are possible near-term. Closes above the 50-day moving average crossing at 13.07 would confirm that a short-term low has been posted. If March extends the decline off September's high, June's low crossing at 12.26 is the next downside target. 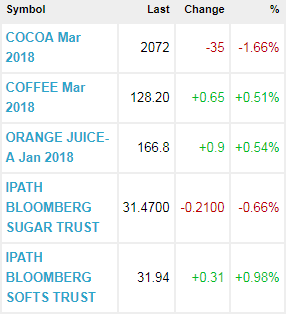 March cocoa closed lower on Monday and below the 50-day moving average crossing at 20.84 opening the door for additional weakness near-term. The low-range close sets the stage for a steady to lower opening on Tuesday. Stochastics and the RSI are neutral to bearish signaling that sideways to lower prices are possible near-term. If March extends the decline off November's high, November's low crossing at 20.32 is the next downside target. Closes above the 20-day moving average crossing at 21.27 would confirm that a short-term low has been posted. 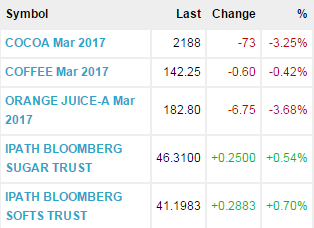 March sugar closed lower on Monday. The mid-range close set the stage for a steady to lower opening on Tuesday. Stochastics and the RSI are overbought but remain neutral to bullish signaling that sideways to higher prices are possible near-term. If March extends the rally off September's low, August's high crossing at 15.82 is the next upside target. Closes below the 20-day moving average crossing at 14.93 would confirm that a short-term top has been posted. March cotton posted a downside reversal with a lower close on Monday as it consolidated some of this month's rally. The low-range close sets the stage for a steady to lower opening on Tuesday. Stochastics and the RSI are overbought but remain neutral to bullish signaling that sideways to higher prices are possible near-term. If March extends the rally off October's low, September's high crossing at 74.00 is the next upside target. Closes below the 20-day moving average crossing at 69.37 would confirm a short-term top has been posted. March Corn closed down 3-cents at 3.52. 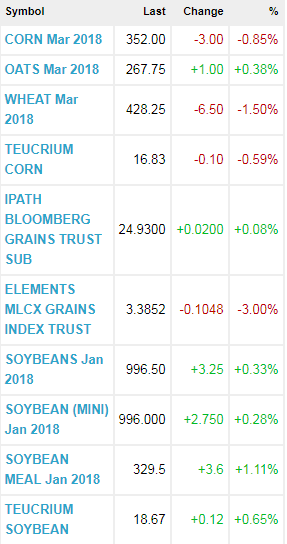 March corn closed lower on Monday. The low-range close sets the stage for a steady to lower opening when Tuesday's night session begins trading. Stochastics and the RSI are turning neutral to bearish signaling that sideways to lower prices are possible near-term. If March renews this month's decline, weekly support crossing at 3.32 is the next downside target. Closes above the 50-day moving average crossing at 3.61 are needed to confirm that a short-term low has been posted. First resistance is the 50-day moving average crossing at 3.61. Second resistance is the reaction high crossing at 3.69 1/4. First support is November's low crossing at 3.48 3/4. Second support is weekly support crossing at 3.32. March wheat closed down 6 1/4-cent at 4.28 1/2. March wheat closed lower on Monday as it extends this year's decline. The low-range close sets the stage for a steady to lower opening when Tuesday's night session begins trading. Stochastics and the RSI are neutral to bearish signaling that sideways to lower prices are possible near-term. If March extends the decline off September's high, weekly support crossing at 4.25 is the next downside target. Closes above the 50-day moving average crossing at 4.52 1/2 are needed to confirm that a short-term low has been posted. First resistance is the 50-day moving average crossing at 4.52 1/2. Second resistance is the reaction high crossing at 4.60 3/4. First support is today's low crossing at 4.27 1/2. Second support is weekly support crossing at 4.25. March Kansas City Wheat closed down 6 3/4-cents at 4.25 1/4. March Kansas City wheat closed lower on Monday as it extends this year's decline. The low-range close sets the stage for a steady to lower opening on Tuesday. Stochastics and the RSI are neutral to bearish signaling that sideways to lower prices are possible near-term. If March extends the decline off September's high, weekly support crossing at 4.11 1/4 is the next downside target. Closes above the 50-day moving average crossing at 4.49 1/4 are needed to confirm that a short-term low has been posted. First resistance is the 50-day moving average crossing at 4.49 1/4. Second resistance is reaction high crossing at 4.56 1/2. First support is today's low crossing at 4.25. Second support is weekly support crossing at 4.11 1/4. March Minneapolis wheat closed down 11 1/2-cents at 6.27. 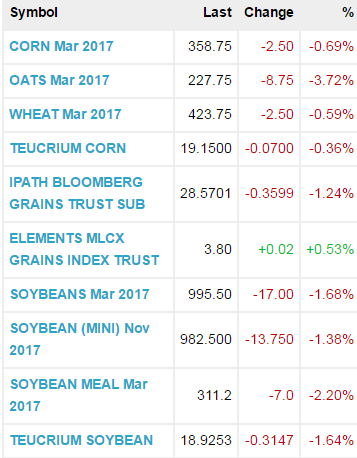 March Minneapolis wheat closed lower on Monday. The low-range close sets the stage for a steady to lower opening when Tuesday's night session begins trading. Stochastics and the RSI are oversold but remain neutral to bearish signaling that sideways to lower prices are possible near-term. Closes below October's low crossing at 6.20 would confirm a downside breakout of this fall's trading range. Closes above trading range resistance crossing at 6.66 would confirm an upside breakout of this fall's trading range. First resistance is November's high resistance crossing at 6.66. Second resistance is the reaction high crossing at 6.81. First support is October's low crossing at 6.20. Second support is the 87% retracement level of the April-July-rally crossing at 5.89 1/2. January soybeans closed up 3 1/4-cents at 9.96 1/2. January soybeans closed higher on Monday as it extended the rally off November's low. The mid-range close sets the stage for a steady to higher opening when Tuesday's night session begins trading. Stochastics and the RSI are neutral to bullish signaling that sideways to higher prices are possible near-term. If January extends the rally off November's low, November's high crossing at 10.08 1/4 is the next upside target. Closes below the 10-day moving average crossing at 9.85 would confirm that a short-term top has been posted. First resistance is October's high crossing at 10.13. Second resistance is the reaction high crossing at 10.28 1/4. First support is October's low crossing at 9.63 1/4. Second support is September's low crossing at 9.47 1/2. January soybean meal closed up $3.60 at 329.50. January soybean meal closed higher on Monday. The high-range close sets the stage for a steady to higher opening when Tuesday's night session begins trading. Stochastics and the RSI are neutral to bullish signaling that sideways to higher prices are possible near-term. If January extends this month's rally, the 75% retracement level of the July-August-decline crossing at 336.50 is the next upside target. Closes below the 20-day moving average crossing at 318.10 would confirm that a short-term top has been posted. First resistance is today's high crossing at 331.90. Second resistance is the 75% retracement level of the July-August-decline crossing at 336.50. First support is the 20-day moving average crossing at 318.10. Second support is November's low crossing at 311.60. January soybean oil closed down 28-points at 33.80. January soybean oil closed lower on Monday as it extends the decline off November's high. The low-range close sets the stage for a steady to lower opening when Tuesday's night session begins trading. Stochastics and the RSI are neutral to bearish signaling that sideways to lower prices are possible near-term. If January extends the decline off November's high, the reaction low crossing at 33.43 is the next downside target. Closes above the reaction high crossing at 34.99 would confirm that a short-term low has been posted. First resistance is the reaction high crossing at 34.99. Second resistance is November's high crossing at 35.61. First support is the reaction low crossing at 33.43. Second support is the reaction low crossing at 33.04. The December NASDAQ 100 closed slightly lower on Monday as weakness in energy stocks offset the rally by retail stocks. The mid-range close sets the stage for a steady to lower opening when Tuesday's night session begins trading. Stochastics and the RSI are overbought but remain neutral to bullish signaling that sideways to higher prices are possible near-term. If December extends this year's rally into record territory, upside targets will be hard to project. Closes below the 20-day moving average crossing at 6313.76 would confirm that a short-term top has been posted. First resistance is today's high crossing at 6424.50. Second resistance is unknown. First support is the 20-day moving average crossing at 6313.76. Second support is the reaction low crossing at 6230.75. The December S&P 500 closed slightly higher on Monday as it extended this month's rally. The mid-range close sets the stage for a steady opening when Tuesday's night session begins trading. Stochastics and the RSI are overbought but remain neutral to bullish signaling that sideways to higher prices are possible near-term. If December extends this year's rally into uncharted territory, upside targets will be hard to project. Closes below the 20-day moving average crossing at 2583.02 would confirm that a short-term top has been posted. First resistance is today's high crossing at 2604.00. Second resistance is unknown. First support is the 20-day moving average crossing at 2583.02. Second support is the reaction low crossing at 2556.70. The Dow closed higher on Monday as it extended this year's rally into record territory. The low-range close sets the stage for a steady to lower opening when Tuesday's night session begins trading. Stochastics and the RSI are becoming overbought but remain neutral to bullish signaling that sideways to higher prices are possible near-term. If the Dow extends this year's rally into uncharted territory, upside targets will be hard to project. Closes below the November 21st gap crossing at 23,456.88 would confirm that a short-term top has been posted. First resistance is today's high crossing at 23,638.92. Second resistance is unknown. First support is the November 21st gap crossing at 23,456.88. Second support is the November 16th gap crossing at 23,344.99. December T-bonds closed down 1/32's at 154-07. December T-bonds closed slightly lower on Monday. The low-range close sets the stage for a steady to lower opening when Tuesday's night session begins trading. Stochastics and the RSI are overbought but remain neutral to bullish signaling that sideways to higher prices are possible near-term. If December extended the rally off November's low, the reaction high crossing at 155-04 is the next upside target. Closes below the 50-day moving average crossing at 153-06 would confirm that a short-term top has been posted. First resistance is November's high crossing at 154-26. Second resistance is the reaction high crossing at 155-04. First support is the reaction low crossing at 151-31. Second support is October's low crossing at 150-10. December T-notes closed up 25/32's at 125-015. 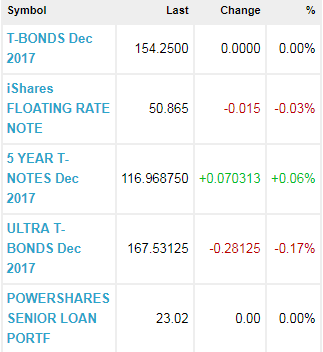 December T-notes closed higher on Monday. The high-range close sets the stage for a steady to higher opening when Tuesday's night session begins trading. Stochastics and the RSI are turning neutral to bullish signaling that sideways to higher prices are possible near-term. Closes above the 50-day moving average crossing at 125.058 would confirm that a low has been posted. If December resumes the decline off November's high, October's low crossing at 124.060 is the next downside target. First resistance is the 50-day moving average crossing at 125.058. Second resistance is October's high crossing at 125.255. First support is November's low crossing at 124.270. Second support is October's low crossing at 124.060. December hogs closed up $1.28 at $64.53. 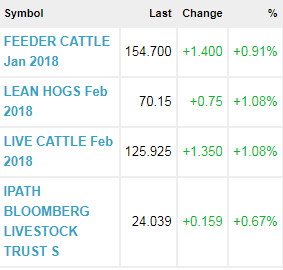 December hogs closed higher on Monday. The high-range close sets the stage for a steady to higher opening when Tuesday's session begins trading. Stochastics and the RSI are neutral to bullish signaling that sideways to higher prices are possible near-term. If December extends the rally off November's low, October's high crossing at 68.18 is the next upside target. Closes below the 10-day moving average crossing at 61.75 would confirm that a short-term top has been posted. First resistance is today's high crossing at 64.65. Second resistance is October's high crossing at 68.18. First support is the 10-day moving average crossing at 61.75. Second support is November's low crossing at 59.25. February cattle closed up $1.48 at 126.05. 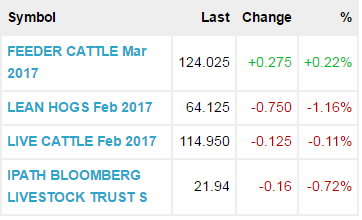 February cattle closed higher on Monday. The high-range close sets the stage for a steady to higher opening when Tuesday's session begins trading. Stochastics and the RSI are neutral to bullish hinting that a low might be in or is near. Closes above the 20-day moving average crossing at 127.13 would confirm that a short-term low has been posted. If February extends the decline off November's high, the reaction low crossing at 119.05 is the next downside target. First resistance is November's high crossing at 131.95. Second resistance is weekly resistance crossing at 134.55. First support is the reaction low crossing at 119.05. Second support is October's low crossing at 116.83. January Feeder cattle closed up $1.15 at $154.45. January Feeder cattle closed higher on Monday as it consolidated some of this month's decline. The high-range close sets the stage for a steady to higher opening when Tuesday's session begins trading. Stochastics and the RSI are neutral to bullish signaling that sideways to higher prices are possible near-term. Closes above the 20-day moving average crossing at 156.15 would confirm that a short-term low has been posted. If January renews this month's decline, October's low crossing at 148.18 is the next downside target. First resistance is November's high crossing at 162.08. Second resistance is weekly resistance crossing at 166.73. First support is last Monday's low crossing at 149.30. Second support is October's low crossing at 148.18.